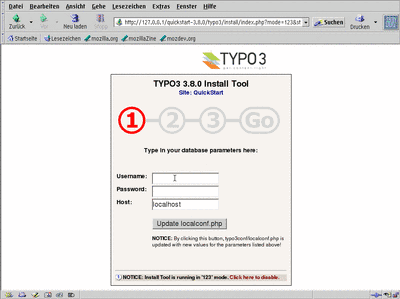 Step 3 - Installing of TYPO3: Quickstart or Dummy? 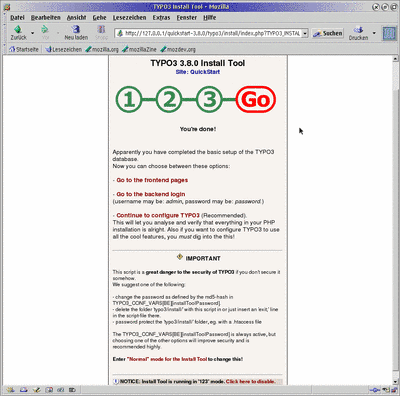 To do's of "TYPO3 goes eComStation"
In autumn 2003, after a Typo3-workshop there was born the idea of running TYPO3 on OS/2 and eComStation. Unfortunately, I (Roland) was missing the skill to do it on my own. After some successful TYPO3-installations on Windows and Linux at the end of January 2004 I asked the german community if someone has the knowledge and spare time to make the necessary modifications. I missed the resonance, TYPO3 was really unknown in our groups. 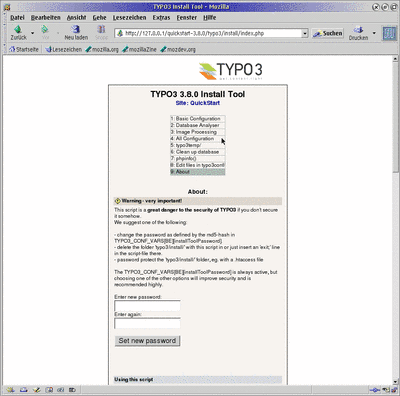 The situation began to change after doing several sessions related to TYPO3 at OS/2-clubs. "Hello Roland, I've got TYPO3 3.8.0 running on eComStation 1.1." This was the initial ignition for more then 4 weeks now of intensive and nightfull "hours of lab" to get the big step from an only errorfree working TYPO3 backend login to a running "TYPO3 goes eComStation". The actual result seems to be very promising and should be reproducable from everyone out in the OS/2 communities on base of the following cook recipe. This will be the ticket of admission in an new area for using OS/2 as a platform for web services too. In the meantime we check at 2 reference installations against our 2 descriptions to prove or correct them. You are reading now one version and the other can be found at Michaels project web site AMPOS/2. One major task to do is the missing port of ImageMagick to OS/2, I have got the chance to invite Paul Smedley from Australia for that job. The most parts of the rest are available, some minor stuff like changes to phpMyAdmin code and porting of sendmail should be realizable. We are still working hard in our spare time to make the "maiden flight" of the whole package possible before Warpstock 2005. And if the community is interested in our work Michael, Paul und I will stay at the "joystick". While there is an error with the delivery of the generated webpages with apache 2.0.53 and 2.0.55, we request you to use the alternate package with apache 1.3.33. We have marked the alternative as option A. As soon as we find the error, we will tell you. Normally you can update the Apache/2 with a newer version by extracting the new archive over your existing installation. The config-file (httpd.conf) will not be overwritten, while your startup.cmd unfortunately is. So please be sure to make a backup before your update. Go to the subdirectory \Apps\apache1\conf and copy httpd.conf-dist-os2 to httpd.conf. Then open the file with any text-editor you like. 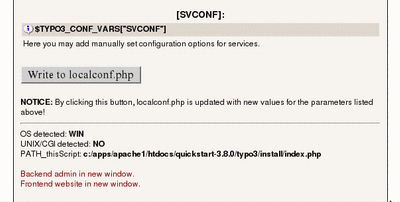 Please copy file httpd-std.conf in folder \Apps\apache2\conf to httpd.conf and open it in your editor. If you only want to use Apache/2 with a certain IP address of your pc you should change »Listen 80« e.g. in »Listen 192.168.0.100:80«. But it is also possible to use your local loopback interface (127.0.0.1). With the last option your Apache/2 only allow connections from the same pc. This will be very helpful for testing purposes. You have installed Apache/2 without errors! Please delete the old file c:\ecs\dll\wpirtl.dll by hand before upgrading! After that checks you are able to start the installation of the 3 packages with together 282 files. - move mysql41.dll from folder c:\Apps\mysql41\bin\ to c:\Apps\mysql41\dll. - rename the program object "Start Server" to "Run MySQL 4.1.7 Server"
To check the changes of LIBPATH it will be a good idea to restart your pc now and to try to start and stop MySQL/2. It should work without any errors. Due to compiling problems the command line client out of the MySQL/2 archive version 4.1.7 has no built-in command history for easily recall of prentered commands. Last but not least you should create a program object for this mysql.exe. Please remember your computer has to be restarted first before you are able to use the change of the LIBPATH-definition. You have to restart Apache/2 for using that new adjustments. Apache/2, MySQL/2 and PHP/2 was installed without errors! At first we create a folder c:\Apps\apache1\htdocs\phpmyadmin (Apache/2 1.3.33) or c:\Apps\apache2\htdocs\phpmyadmin (Apache/2 2.0.5x). Then get the archive phpMyAdmin-2.5.7-pl1.zip and unzip the contents to that folder (please be aware there is no further folder phpMyAdmin-2.5.7-pl1). Calling the 127.0.0.1/phpmyadmin/index.php with your favorite browser will show up the welcome page of phpMyAdmin. Because there is no newer ImageMagick OS/2-port since version 4.2.2 (I couldn't found any) and you have to have that package for usefull operation of TYPO3, I asked (hint of Andreas Roederer) Paul Smedley trying a new port and get me tested the provisional results (Roland Schmalenberg). It seems to be relative good and I hope, I can release that package together with Paul as a beta until Warpstock 2005.
the correct delivery of websites at the frontend (FE). 2. 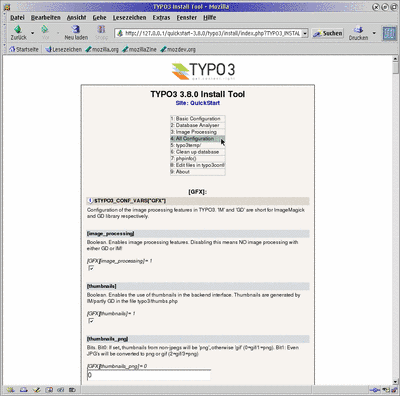 After that you should install the "empty" TYPO3-package dummy-3.8.0 for your own webproject. 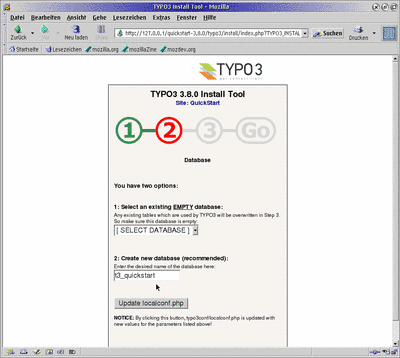 Both of that alternatives will be explained now step by step, and afterwards you are able to use the offical documentation of TYPO3 for the further questions around using and operating. Get the quickstart-3.8.0.zip from the download-area of typo3.org and unzip this archive to the folder \htdocs\ of your ready installed Apache/2. For this method you need my REXX-script-pack GetTypo3forOS2_1_15.zip, please download and unzip it to the folder \htdocs\ of your installed Apache/2. Now your TYPO3 was prepared to run in the so-called 1-2-3-Install Tool and you can do the documented next steps for the successful configuration. Start MySQL/2- and Apache/2-Server before you try to load the local Quickstart-installation in your browser. If you want to go to the real world, you have to change that access entries before! 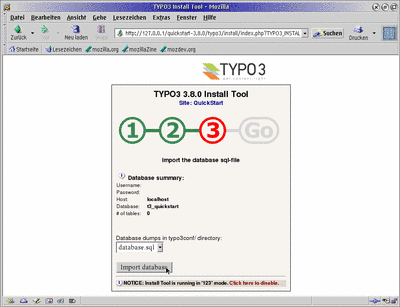 In step 2 of the TYPO3 1-2-3 Install Tool you have to define the database to be used. Okay, in the last step we have to fill the "empty" database with "t3_quickstart" to create the homepage of a soccer club as an example for learning more about TYPO3 (uups, had I mentioned that before, no, okay we haven't got any more secrets ...). You're done and we won't click one of the links to the "frontend pages" or the "backend login", we follow the recommended way and click on "Continue to configure TYPO3" to make further changes. That's it we have finished the first installation of TYPO3! And what's about our presentation of the soccer club? Does it work? Please get the homepage of the virtual soccer club by loading "http://127.0.0.1/quickstart-3.8.0/"
If you get presented that page of the soccer club "FC Bigfeet" you really have got a further milestone! 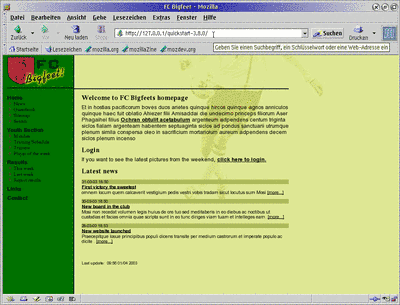 Image 13: The homepage of the big feet in the prettiest grass-green! Let's quote Kasper: Hallelujah, it works! Those documents are also available in Danish (original) and translations to French, German and Spanish. 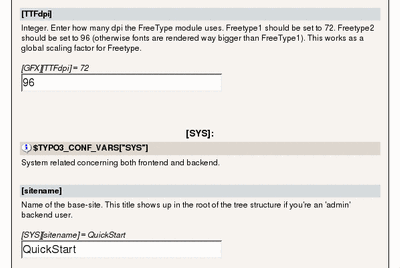 Successful working with this tutorial will be the best proof of "TYPO3 goes eComStation". 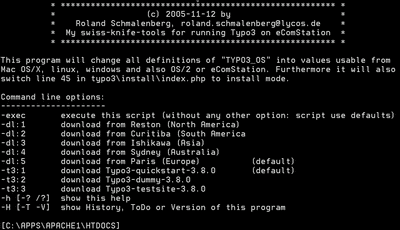 "TYPO3 goes eComStation" is really working! Do we have forgot something? Who will do that jobs? to Michael's wife Petra and his family, to Anja and my family, without their support it would not have been possible to create "TYPO3 goes eComStation"